1, Qasīda ‘Iqd al-Thamīn by Shaykh Abu Bakr al-Mullā : A poem in praise of the Prophet (Allah bless him and give him peace) which can be sung to the tune of the Burda. 3. 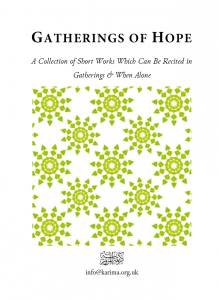 A Prayer for the Muslim World by Shaykh Yusuf al-Nabhānī: A short collection of concise prayers for the relief of suffering across the Muslim world. 5. Beneficial Prayers by Shaykh Abu Bakr al-Mullā : A collection of Quranic verses and Prophetic supplications which the author selected from the Hizb al-Azam of Mulla Ali al-Qari. 6. Selections from Dua Khatm al-Qurān of Shaykh Abdullah al-Khaṭīb al-Ja‘farī & Shaykh Abu Bakr al-Mullā : A combination of two works on this topic which will facilitate those who have completed a Quran recital to donate the reward of their recital to the deceased. 7. Forty Ṣalawāt from Hadith by Imām Taqī al-Dīn al-Subkī : Taken from the classic work Shifa al-Siqam.